Looking north at the tiny settlement at the crossroads of Lorraine & Spring Valley Roads. The Geiger Store would have been west of the School, pictured in white. The Spring Valley Cemetery is located one half mile north on Spring Valley Road. The tiny settlement of Spring Valley was most notably significant for its location as a stage stop on the west Cherry Stage Road at the Gile Ranch. The Frankstown and Gile Station Wagon Road was established in 1866. Tolls ranged from .25 for a horse and rider to $1.00 per wagon and team. Weekly stages came through the area carrying mail and passengers. Indians inhabited the area in the early 1860’s and often had altercations with settlers. Jotham Lincoln, one of the original settlers at Spring Valley, was killed by Indians in 1868 while working his fields. 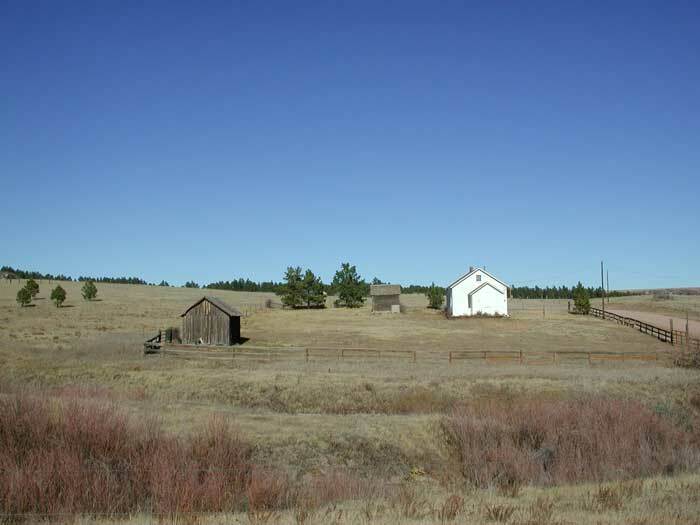 This early town site consisted of the Geiger Store, blacksmith shop and livery stable, Gile hotel and stage stop, cemetery, and Spring Valley School, the third school district in Douglas County making it one of the oldest. Later, in 1894, the Spring Valley Cheese Company provided income for local ranchers buying their milk. The school still stands today virtually unchanged from a century ago and is the only visible intact structure remaining. A post office was established at the home of George W. Redman in 1865 and later closed in 1885. Population was stated at 100 people in 1887. Spring Valley Cemetery is a pioneer cemetery with many of the original settlers of Douglas and northern El Paso Counties being buried there. The land for the cemetery was specifically deeded in 1877, but the ground as a burial site was in use before that time. The grave stones tell a story of just how difficult life was on the Palmer Divide before the turn of the century. Epidemics such as small pox and farming accidents took the lives of many of the early settlers. In 1880 one family lost six children to diphtheria in one year. The legendary Irishman Pat Murphy is buried in Spring Valley Cemetery. Spring Valley today is still open grassland but most of the large ranches have disappeared or have been reduced in size. The Geiger family still ranches on the original site homesteaded in 1869 by John Geiger. Thankfully, the Douglas County master plan keeps southern Douglas County in larger acre parcels and much has already been secured into perpetual open space.